by Bill Dwight on Thursday, June 11, 2015 at 4:49 PM | LEAVE A COMMENT! Do your kids have access to email or text messages? Then it’s time to teach them about “phishing” — sneaky attempts to extract sensitive personal information like usernames, passwords, account numbers, etc. Coach your child to never respond directly to these types of unsolicited inquiries. 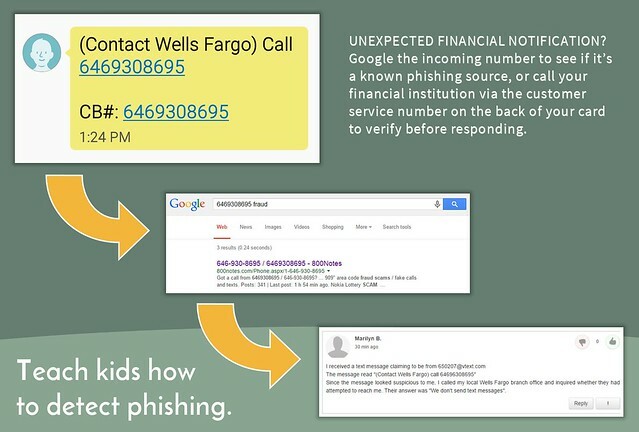 Google the incoming number to see if it’s a known phishing source. You can also call your financial institution directly to inquire about the validity of the message. Call using the customer service number listed on the back of your card or on the official web site. That way, you can be certain you’re talking to a legitimate party. With your help, your kids will quickly learn how to detect “phishy” communications and keep their accounts safe.